Wow! These pages are beautiful! It’s so great to see pages (and your book covers) match the beauty of what you’ve written (or at least to the best of their ability). Congrats! Sharon this is just so wonderful. You deserve this as you’ve written such beautiful stories. I can’t wait to read Loving Mr Darcy! I am so pleased for you Sharon, what a wonderful spread! Well deserved. This is so awesome! What a lovely spread! It is really well done and you should be excited! Enjoy the happy dance! Thanks everyone! It is a wonderful layout, I have to admit. I forgot to mention that looking through the entire catalog is worth while. Naturally my fellow Casablanca authors from our blog have pages in their too. But Sourcebooks has a number of interesting novels coming out this fall, some I was not aware of, that look pretty good. Just and FYI. That looks wonderful, perfect, amazing! You can be so proud about your books! Enjoy what you have already achieved! Hi Sharon! 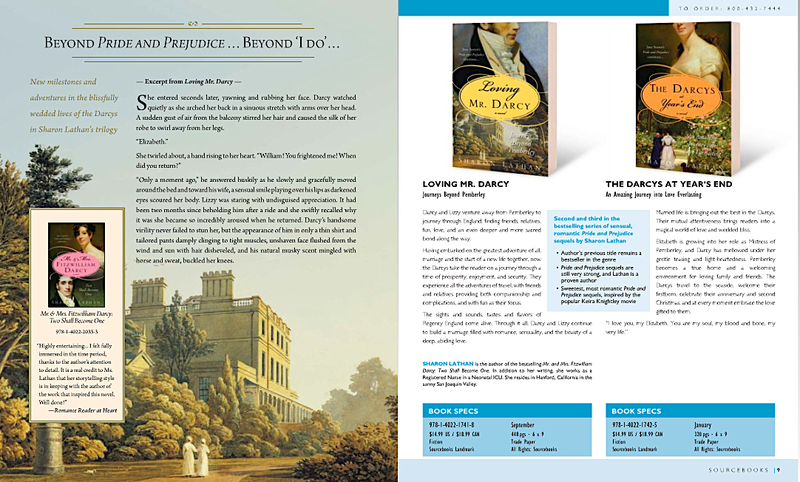 Congratulations on the spread in Sourcebooks catalog! They did an exceedingly good job on the display. It looks wonderful!!!!!!! I am sooooooooo happy for you. Take care and God Bless, my friend. Sharon, this is absolutely fantastic, congratulations!! I really like the description they gave for your books and the illustrations are beautiful, sure to attract many buyers. I too am so excited and thrilled for you! WOO HOO! How beautiful! I love it! I’m so happy for you. This is awesome Sharon!!!! I love it congratulations!! !